@ProfTerryHughes The coal lobby just stepped up advertising, trying to con Asian countries into dependence on coal imports for obsolete coal USC technology. @WorldCoal Devious, hoping to lock-in #coal demand with out-dated USC HELE technology in Asia. @MineralsCouncil 'Coal will pass gas as southeast Asia’s number one energy source before 2025, the OIES report concluded'. Read it.....COAL will REPLACE GAS! Approaches for increasing the supply of natural gas were on the agenda, but renewable energy production of natural gas didn't get a mention. The absence of Bioenergy Australia which is holding a Bioenergy Business Breakfast in Adelaide next week left the struggling oil and gas industry bereft of a host of ideas to address the intractable problem of rising costs of extracting natural gas. The problem it faces is that there aren't any more low-cost natural gas reserves to exploit. New methods for producing natural gas from renewable energy are being developed and refined, continually lowering costs and improving efficiency. 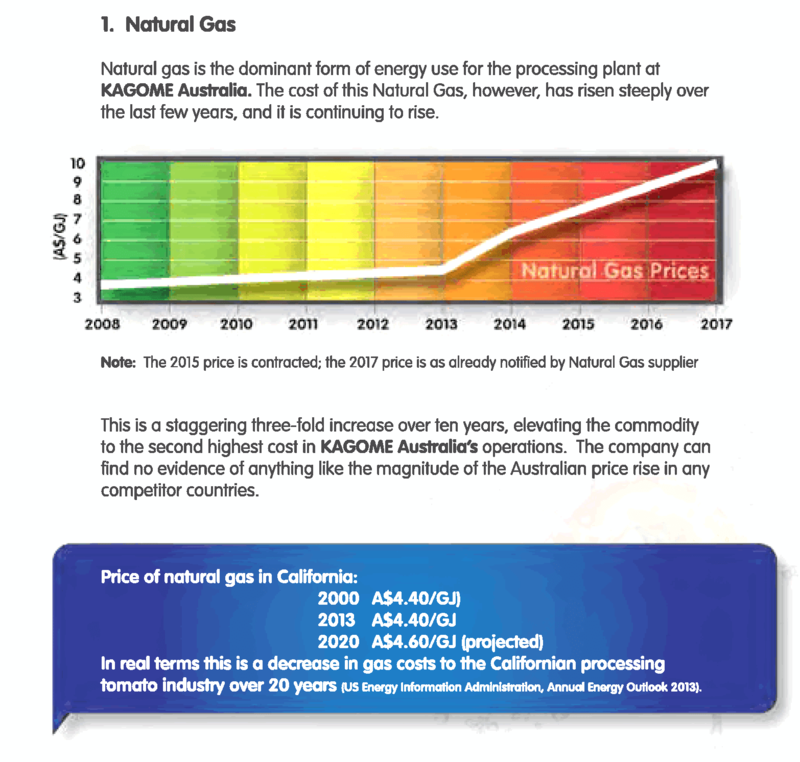 The cost of extracting coal seam gas is constantly increasing. The domestic price of natural is continuing to rise. These factors are making it more commercially attractive to produce natural gas from renewable energy. Carbon dioxide can be converted into carbon-containing compounds and oxygen by algae and other plants using sunlight to drive photosynthesis. Carbon dioxide can also be converted into natural gas and water using hydrogen produced from electrolysis of water using electricity from renewable energy generation. Oxygen is produced as a by-product as in the first process. Any carbon-containing compounds including those produced by algae and plants in the first process described above along with farm waste and municipal waste, can be converted into a mixture of methane and carbon dioxide. About half the carbon in the input feed stock is converted into methane, and the other half into carbon dioxide. After the carbon dioxide produced as a by-product is separated, it can be converted into methane by recycling it into either of the first two processes. No "carbon capture and storage" required, avoiding a susbstantial cost of using natural gas from fossil fuel reserves. Long established technologies use methane-producing bacteria that create methane and carbon dioxide in anaerobic fermentation ponds or tanks. More recently plants have become available that use supercritical water as a gasification medium to create methane and carbon dioxide. These complete the gasification process more quickly and so don't need large tanks where methane-producing bacteria gradually transform the feed stock. This newer technology is especially well-suited for wet feed stock as there is no need to dry it. 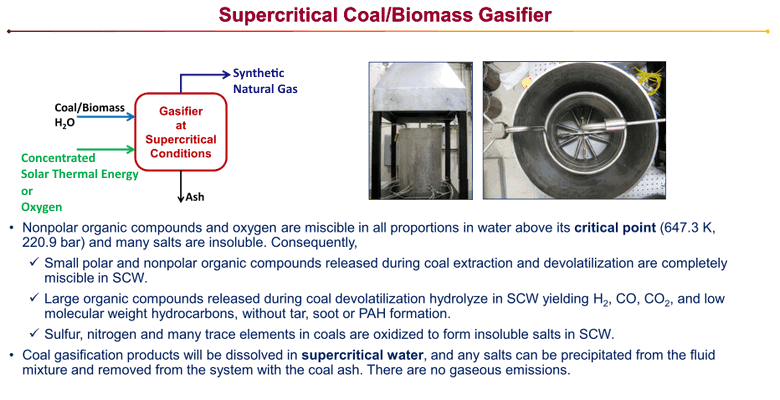 These more recent technologies can also efficiently convert low-grade coal with high moisture content into natural gas. 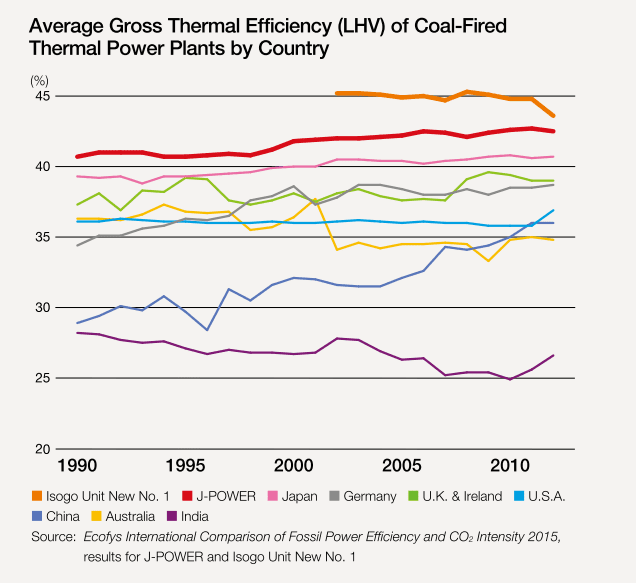 Existing coal-fired power could use this option to improve efficiency and lower emissions until it is feasible to decommission them. Researchers at ENN Group, China and Carleton University, Canada recently investigated supercritical water lignite gasification technology. See "Coal-based Clean Energy Production", Advances in Energy Engineering (AEE) Volume 1 Issue 4, October 2013. More recently the Lappeenranta University of Technology, Finland, completed an assessment of the option of Australia becoming a major exporter of renewable energy to Asia - making use of the Queensland LNG export facilities - to ship natural gas made with renewable energy. See "Can Australia Power the Energy-Hungry Asia with Renewable Energy?" The heating value of Indian coal is, on average, about 60 percent of the heating value of coal burned in the United States. This increases the amount of coal that must be burned to generate a given heat input, implying higher auxiliary electricity consumption to run coal grinding equipment, conveyors, and pumps. In the meantime there are options to increase efficiency and reduce harmful emissions until it is feasible to decommission these coal-fired power stations. One of these options is to pre-process the low-grade coal before combustion. The technology available to do this has several advantages. It eliminates the particulate and sulphur dioxide emissions and, more importantly, increases the efficiency of these coal-fired power stations. Scrubbers and other post-combustion filters are no longer needed. Low-grade coal contains relatively high levels of contaminants and moisture content. The moisture content reduces the energy available for power generation when its burned because energy is wasted converting the moisture into water vapour. The contaminants increase the energy that is used to run pollution abatement equipment. 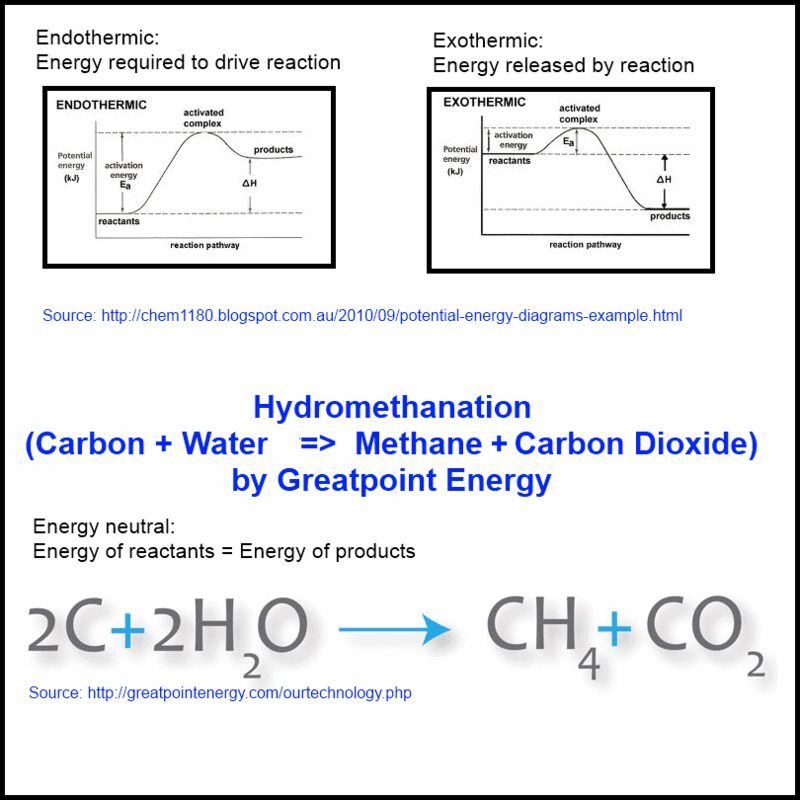 To understand the available technology this simplified model gives a reasonable approximation of what takes place; Consider a process in which carbon and water are placed in a reaction vessel and an environment is created to promote a desired reaction that uses little or no external energy. The reaction breaks down some of the water into oxygen and hydrogen. The oxygen reacts with half of the carbon to form carbon dioxide and the hydrogen reacts with the remainder of the carbon to create methane. The energy released by the reactions with carbon provide the energy needed to break down water into oxygen and hydrogen. The methane can be separated to use in place of low-grade coal in the existing coal-fired power stations. There are no particulates or sulphur dioxide to be removed from the exhaust gases. 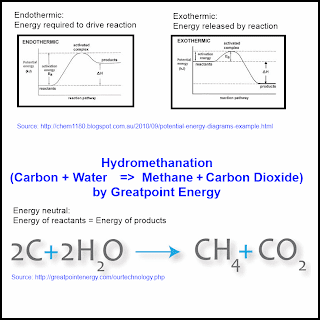 When methane burns, about half the energy is produced by the reaction of carbon with oxygen to produce carbon dioxide, and about half is produced by the reaction of hydrogen with oxygen to form water vapour. Note that the total amount of energy is the same as would have been produced if all of the carbon had been burned and not pre-processed into carbon dioxide and methane. The moisture content that was present in the low-grade coal has been separated, as water, before combustion. No energy is wasted converting that moisture into water vapour. Australian coal seam gas is expensive to extract: about $4 to $5 a gigajoule. The U.S. wholesale gas price is only $3 a gigajoule. 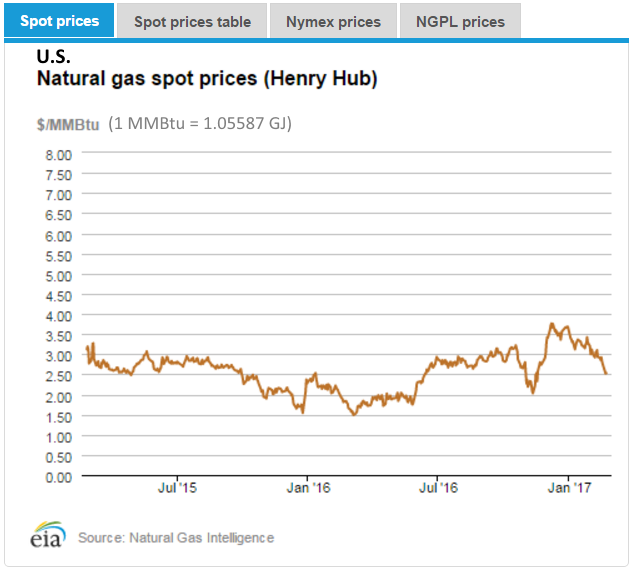 One option for increasing the natural gas supply in Australia, though it isn't the preferred option, is to import LNG from the U.S. The point to take away from this is that coal seam gas in Australia, facing competition from the U.S. that is rapidly expanding its LNG export capacity, is unlikely to be commercially viable within a few years. Expanding the unconventional gas industry that has little prospect of long-term commercial viability isn't a good investment. 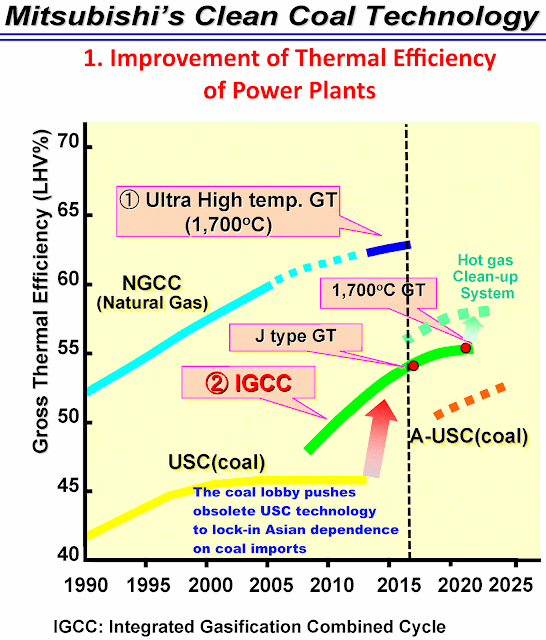 Another option for increasing the supply of natural gas is to make it from coal. Black coal in Australia is being sold into an over-supplied export market where the price is falling to around $2 a gigajoule. Brown coal costs only about 50 cents a gigajoule. New processes are available that can make methane from coal relatively cleanly. Coal mixed with water and heated to 400 centigrade with solar thermal energy reacts to form approximately equal quantities of carbon dioxide and natural gas. Another way to heat the mixture is to add hydrogen produced by wind turbines or solar PV systems. With sufficient hydrogen, all of the carbon in the mixture reacts with the hydrogen to form natural gas and no carbon dioxide is created.